This weather girl is dressed so brightly that I feel a migraine coming on just looking at her, but the weather predictions behind her might prove to be a more devastating headache. Having acted as personal bodyguard to the blackcock and his greyhen over the past few months, I now have serious concerns that a disaster is on the horizon. I have stripped crows, stoats and foxes off the area where I know she is sitting, and I am now reasonably confident that if the greyhen’s eggs hatch into clear mild weather, she should have little difficulty in bringing them up as healthy poults. I have less promising hopes for the other black grouse on the hill, but being limited by a shortage of time and resources, I chose to concentrate on preserving one pair rather than doing a half job on a larger scale. However, if the rain continues to fall as it has for the past week, the little chicks will step into the world for just long enough to catch a chill and die. It seems silly that a bird found only in exposed areas of open moorland should be so vulnerable to cold, wet weather, but it has been shown to make a serious difference to brood mortality. It’s not cold at the moment, but for a little chick that can’t regulate its own body temperature, a good soaking can be fatal. If it continues to rain, all my work will be wasted this year. While I’ll continue to trap stoats and punch foxes for the greater good, it seems like a great deal hangs on the next few days. Given the depressing nature of this afternoon’s weather reports, I just have to hope that they’re wrong. This poor bugger looks quite down in the mouth. He had just hit a deer fence, which you can clearly make out behind him. 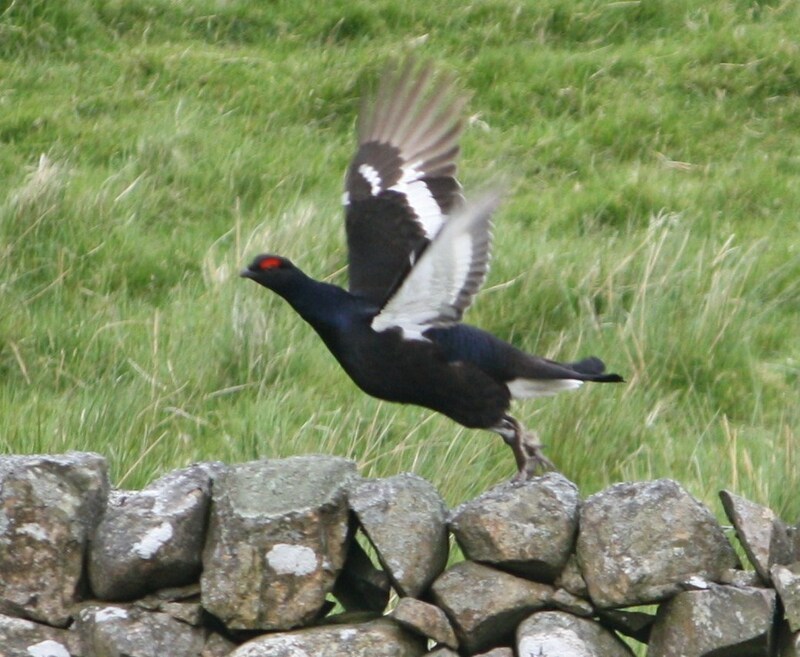 Black grouse are some of the fastest British gamebirds. Their deceptively large size and bulky shape might make you think that these birds are the equivalent of a lumbering Avro Lancaster on the wing, but in truth, they can hit speeds of over 70mph, and they could probably fly even faster downwind if they didn’t have a long tail which gets easily tangled by a draft from behind. A blackcock on the wing is an observant beast, constantly stretching his long neck up to keep tabs on what is happening around him, but high speed brings with it high risks. Whistling through the air at the same speed as a car on the motorway, black grouse are vulnerable to collisions, particularly with fences and unmarked telegraph wires. Thankfully, Galloway’s red deer population is centred away from the Chayne and there is no real need for tall stretches of high tensile deer fencing on my patch, but birds do hit lower stock fences, particularly when they are stressed or if the fence has been recently erected and is still unfamiliar. A local blackcock was found dead at the foot of some rylock sheep netting just a few months before I began my project, and nasty collisions are by no means a rarity. Up in the Angus Glens, deer fences are far more common, and they can be cited as a worrying cause of mortality amongst adult black grouse. Mike Groves, a fellow moorland enthusiast, spotted a blackcock hit a fence at high speed recently, and although he found that the bird had survived the collision, it was very much the worse for wear. He sent me this picture (above), which is a sad spectacle. A great deal of money has been spent on removing old deer fences in high risk areas to minimise black grouse, red grouse and capercaillie collisions, and many miles of fence have been marked with high visibility netting to warn birds that an impassible object lies before them. When I fenced off an area of moorland on the Chayne last year, I marked the wires with shreds of ripped up clothing, and mercifully that seems to have done the trick. 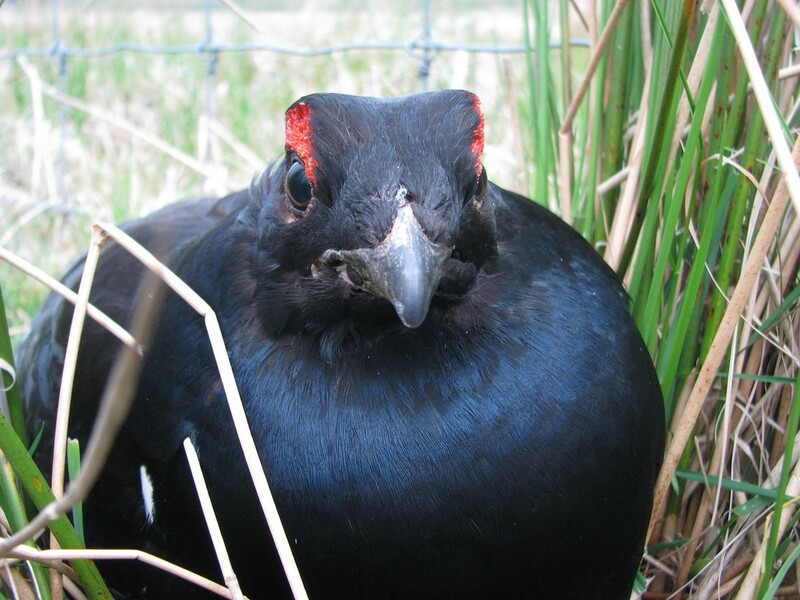 It might seem that black grouse already have enough to contend with without having to worry about hitting fences, but the problem is real and dangerous. At the same time, it needs to be viewed in context. You could mark every fence in the country and still see a decline in black grouse numbers, because this problem is one of many. When I recently claimed that stoats were my favourite British mammal, I made a mistake. Stoats certainly sit very highly on my list of favourites, but I forgot to include an even better beast in my calculations. I have never seen a pine marten in the flesh, but just knowing that they are out there is a real thrill. As a ferret enthusiast, I could hardly fail to love the twitchy arrogance of a marten, and I was always rather sad to see that they are struggling to survive as a viable population in the highlands of Scotland. 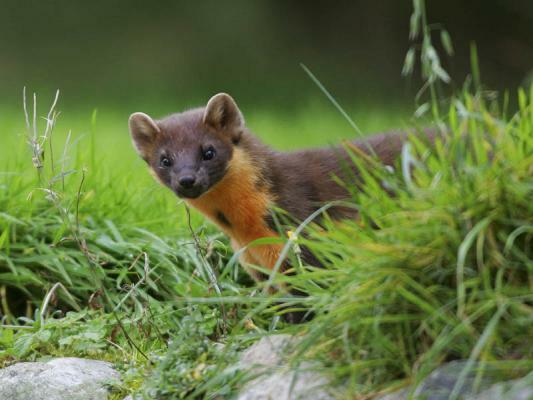 I was surprised and thrilled to hear that pine martens were recently spotted less than twelve miles from the Chayne, and realised that thanks to a reintroduction project in the 1980s, Galloway holds a small population of these cracking little buggers. No longer can I look at pine martens as some kind of dim and distant symbol of the wild highlands, and I now face the real possibility that, if their numbers continue to climb, they will soon be living in the woods around the Chayne. I hope that they will continue to spread their numbers eastward. It seems mad for conservation projects to pour money into reintroducing boring raptors while simultaneously neglecting to give the same attention to predatory mammals, and the project which brough martens back to Galloway should be given some well deserved respect and praise. I know that they spell trouble for a variety of birds, but if it came to it, I would be more than happy to sacrifice some of my birds in exchange for the chance to see a marten of my own. This bridge trap, which has caught several weasels over the past few months, vanished last night during an impressive storm. Pieces of it are still being found. What with the most appalling bad weather over the past 24 hours, it is hardly surprising that some damage should have been caused. Driving onto the Chayne this afternoon, I spotted a beam of wood resting on the stones beneath the old bridge. Getting out of the car to investigate, I found that it was was part of one of my weasel bridge traps, which had been washed six hundred yards down the stream overnight. The placid burn looked harmless, but mats of dead rushes showed how the water level had been over two feet higher last night. Following the burn up the hill, I found that two of my bridge traps had been so badly smashed that only splinters remained. The traps, which were firmly bound to chicken wire frames, had vanished, and it will be some time before the water level is low enough for me to stand a chance of finding them again. Given the fact that the trap I did find was six hundred yards away from where I had left it, these loose traps could be some way downstream, sprung, harmless and wasted. Up on the hill, the wind was impossible. Carrying a bag full of scraps and meat for the two remaining larsen trap call birds, I was nearly blown over three or four times as sudden gusts leaped out of the moss and punched me backwards. Down at the woodcock strip, a line of trees has fallen down over the fence, and a party of good for nothing sterky bullocks were nosing around the gaps in the wire with obvious ill intent. I will have to head back tomorrow with the chainsaw and tidy up the damage before one of those great gits is able to lumber through the fence and destroy the blaeberry. Once I had made it back down to the inbye fields, I accidentally flushed the blackcock from the shelter of a bending ash tree. He was reluctant to go, and he only took to the wing when I appeared less than thirty yards away. In order to keep out of the wind, he flew in the shelter of the drystone dyke at a height of maybe three or four feet. I watched as he flew away, only to be catapulted vertically into the air by an unexpectedly violent gust of wind coming through a gateway. He shot upwards, then turned his head and looked sulkily at me as the wind carried him far into the distance. It’s been a few days since I published a picture of my favourite blackcock, so without further ado, I would like to present the photograph I took this evening while walking my trap line. How could anyone not love these birds? Three larsens; all legal and all suitable for different situations. With larsen trapping drawing to a seasonal close after seven weeks of operation, it’s worth pointing out that this year has been a really steep learning curve for me. Hill crows must be the wiliest devils in the animal kingdom, and although I have taken more than a dozen birds out this year, I must have missed at least the same number again. My problems stemmed from the fact that I was working more or less blind. I had three traps, all of a different design, and I had no idea where to put them. Bit by bit, I worked out some prime locations, but at the risk of being a bad workman blaming his tools, I think that the traps themselves have alot to answer for. There is an increasing variety of different larsen traps on the market, and having found what doesn’t work in my selection of three, I can now look for a trap that will do the job. The first problem is visibility in the trap. There is no point in keeping a call bird in a trap where it is not in full view. Although it is a legal requirement to provide some shelter from wind and rain, the call bird needs to be seen from a long way away, and my own attempts at converting an old hen run into a trap (pictured bottom) fell at the first hurdle. High side boards meant that the callbird needed to sit up on his perch in order to be seen, but in the face of prevailing winds, he seldom bothered. The trap did catch birds, but many must have failed to spot it altogether, or were put off by the illusion of enclosure created by using a low, broad trap with wooden sides. Top entry and side entry traps are suitable for different circumstances, and without a doubt I had more success with my side entry trap. Hill crows seem to like walking around a trap before springing it, and my Solway Multi Larsen (middle) fitted the bill neatly, taking nine crows from a single field over the past few weeks. The disadvantage was that, in order to find a nice open space to use the trap, I was forced to site it in lambing fields, where it was bumped and accidentally sprung by passing sheep and lambs on more than one occassion. 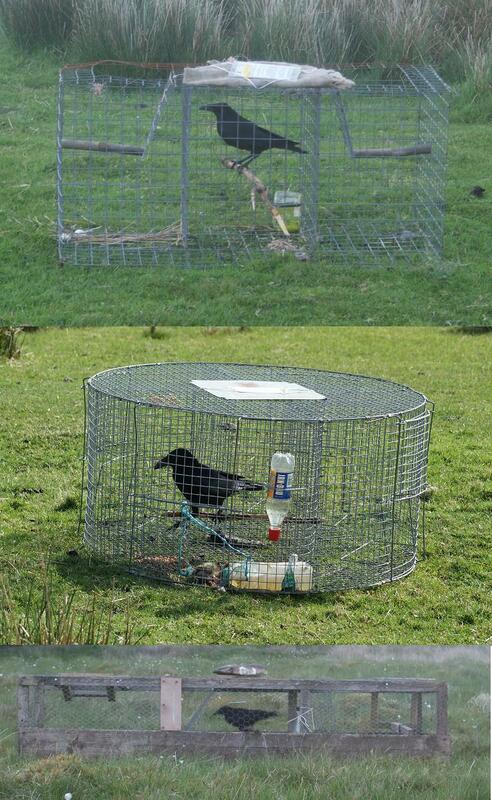 My top entry trap (top) failed to catch any crows whatsoever, and I can wholeheartedly say that this trap is one of the worst I have ever seen. The mesh is so wide (two and a half inch square) that crows reached in from the outside and pulled out food for the call bird without ever considering the possibility of entering from the top. Thanks to a helpful suggestion from a reader of this blog, I now know that I should have put a turf on the roof of the trap so that crows could have landed on the raised grass and dropped in from there. It is perhaps a little late to try this now, but it will be a must for next season. From what I have learned this year, I can see that a secure side entry trap with a robust trigger system would be ideal for the Chayne, and I am currently looking around to see where I might find such a thing. Having missed crows through a variety of silly mistakes and ignorance this year, I will see to it that next year I am not only better informed, but that I am also fully equipped with the perfect traps for the property. Foxes on the Chayne are always too far away for a shot, but having learned to snare them at the GWCT's snaring course, I could start to tip the balance my way at last. After almost eighteen months since beginning this blog, and two years since beginning my project on the Chayne, I have come at last to the inevitable subject of snaring. Having snared foxes on a low ground shoot almost five years ago, I knew some bits and pieces about the technicalities of setting and maintaining snares, but applying knowledge gained in deciduous woodland to the open moors seemed too problematic and full of risk. Snares have attracted a huge amount of publicity over the past few months in Scotland, and several animal rights groups are rabid in their denunciation of these simple traps. In truth, I was reluctant to make a start with snaring because I knew that snares are surrounded by screeds of complex legislation, and that contravening even a single word of the law was and remains out of the question for my project. There is no doubt that, used carelessly, snares can cause damage and harm to wildlife and stock, but having spoken to a variety of keepers and farmers since beginning my project, I began to see that they are a necessary tool for someone in my position. There is no reason why snares can’t be used sensibly and efficiently, and having sat a snaring course and exam yesterday under the watchful eye of the GWCT, I feel better equipped than ever to make a start with this fascinating and complex practice. After a lengthy discussion on the WANE 2011 (Scotland) bill, which came within a whisker of banning snares altogether earlier this year, the students at the snaring course were asked to set snares, then sat a short multiple choice exam on the rights and wrongs of snaring. The only difficult questions were “How far should the stop be set from the eye of a fox snare?” (nine inches) and “What is the minimum breaking strain of snare wire?” (204Kg), and the day felt more like an effort to pool experience and information on efficient snaring practice. We were asked to consider setting snares higher than we would usually do to avoid badgers, and were given an introduction to middens and stink pits. It was familiar territory for many of the keepers present, but I picked up some vital bits and pieces which may help to tip the balance up on the Chayne. While it will be a few months before I make a start with snaring, I now feel confident that I could operate a fox snare legally and humanely. It is now a legal requirement that everyone using snares should have taken this course, and given that it only cost £40, I didn’t feel too hard done by. In fact, I would encourage anyone with an interest in the countryside to consider taking the course. Whatever you think of the practice in moral terms, fox snaring is an art form which takes years to master. At a time when traditional country practices are falling away day by day, it surely does no harm to learn something new and keep some fascinating fieldcraft alive. I left the course with the impression that, like larsen traps, snares are not inherently cruel, but that they can be made so by thoughtlessness and inattention. It’s also fair to assume that snares are no more cruel than the poisons used to kill thousands of rats and mice every year. In a commercial environment, man will apparently stop at nothing in his attempts to kill rodents, so it seems a little imbalanced that snares attract more negative press than widely used bromadiolone based rat poisons, which cause distressing internal haemorraging. 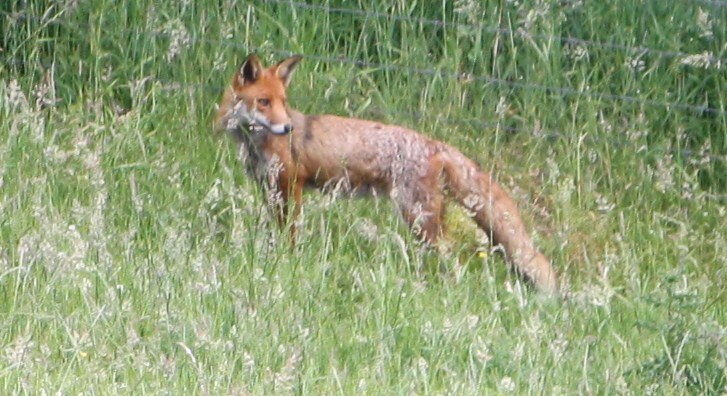 It is not for me to reason why simple fox snares should be taboo while pesky rodents can be bumped off with a cocktail of lethal drugs, but I suppose that accepting the irrational will of the majority is part and parcel of social democracy.